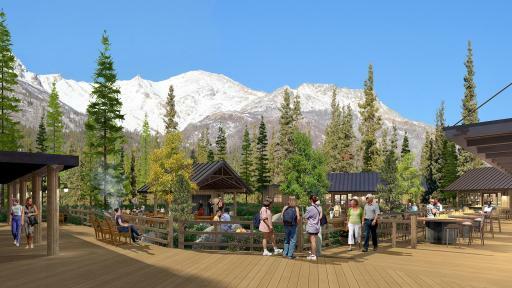 Holland America Line has broken ground on a new “Base Camp” complex at the company’s McKinley Chalet Resort near the entrance to Alaska’s Denali National Park. Expected to be complete for the 2016 Alaska cruise season, Base Camp is part of Holland America Line’s ongoing enhancement program at the property that also includes room updates, upgrades to soft goods and hotel decor and additional modifications. The McKinley Chalet Resort provides accommodations for guests on Holland America Line’s Land+Sea Journeys that combine an Alaska cruise with an overland tour to Denali National Park and beyond. 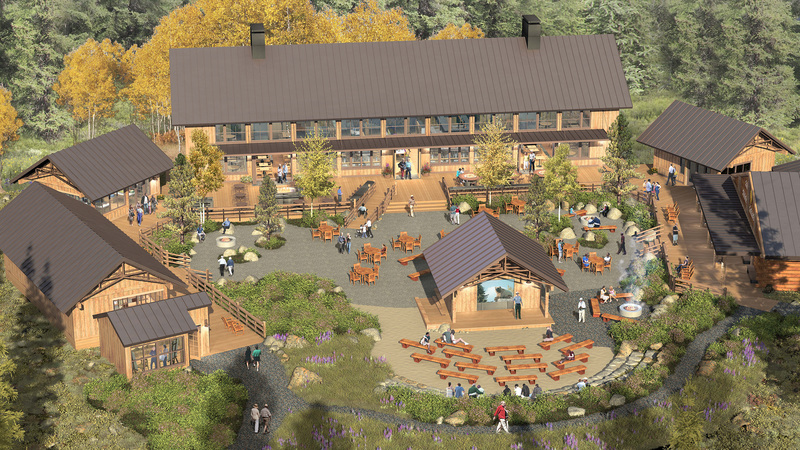 Base Camp will be centrally located between the main part of the property, containing the reception hall, dining facilities and guest rooms, and the riverfront guest rooms that provide stunning views of the Nenana River. Base Camp will serve as a new gathering area to relax, shop, dine and enjoy music and entertainment. The largest building in the complex will be the grand 7,800-square-foot restaurant reaching two stories high to showcase views of the neighboring mountains for dining guests. 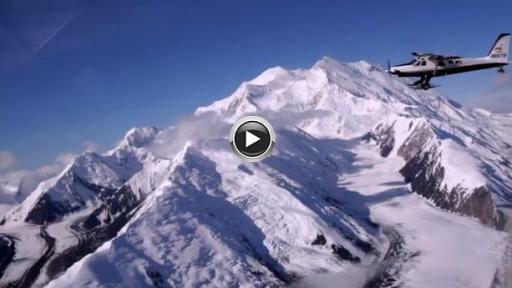 Those wanting to quench their thirst or listen to live music can visit the Gold Nugget Saloon, home to the “Music of Denali Dinner Theater” that becomes a bar and music venue after the show. At the center of Base Camp is an amphitheater with a covered performance stage and a semicircle of bench seating for guests to enjoy a variety of local shows, ranger talks and demonstrations. 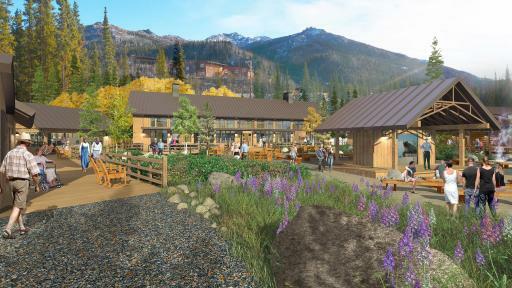 The new location also will feature cozy fire pits to gather around on cool Alaska evenings; outdoor seating for guests who wish to enjoy the scenery; three retail shops offering local goods; and an artist-in-residence cabin where Alaska native and local artists will display and discuss their works. Walking paths in and around Base Camp show off the property’s mountainous landscapes and beautiful setting nestled just across the Nenana River from Denali National Park. 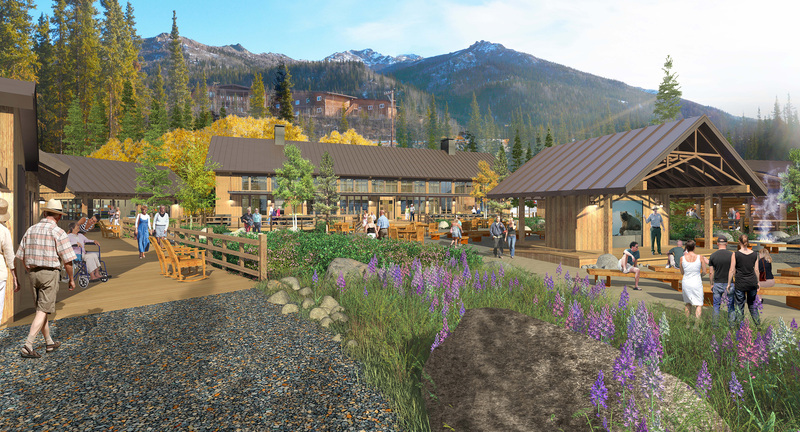 Alaska-based companies heading up the McKinley Chalet Resort’s enhancement project include general contractor Dawson Construction and Stantec, which is providing engineering services. Additional firms involved are lead and landscape architect The Portico Group, restaurant architect Heliotrope Architects, structural engineering company Michael Leonard Associates and project manager Costigan Integrated, all of Seattle, Wash.
Spanning nearly 60 acres, the McKinley Chalet Resort currently features 478 rooms, fine and casual dining, an on-site dinner theater, on-site raft departures and walking trails along the Nenana River. Holland America Line’s Land+Sea Journeys combine the “must-see” of Denali National Park with the “seldom-seen” wonders of the Yukon, including one- or two-night stays in the heart of the Klondike Gold Rush country and up to three-night stays at Denali National Park. This year, the Land+Sea Journeys run May through September and offer 13 options, ranging in total length from 10 to 20 days in two distinct series: Yukon+Denali Land+Sea Journeys and Denali Land+Sea Journeys. 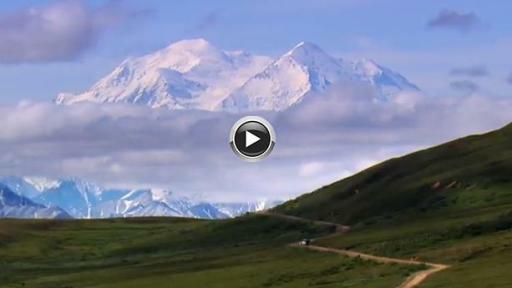 All Land+Sea Journeys combine a three- to seven-night Holland America Line cruise with an overland adventure that includes a one-, two- or three-night stay at Denali National Park as a centerpiece of the Alaska experience. Each Land+Sea Journey also showcases places such as the gold rush town of Dawson City, charming Seward, historic Fairbanks, colorful Skagway and the historic narrow-gauge White Pass and Yukon Route Railroad. For more information about the Alaska Land+Sea Journeys and Holland America Line, contact a travel professional, call 1-877-SAIL-HAL (1-877-724-5425) or visit hollandamerica.com. The Holland America Line Alaska tablet app also is available in the Apple, Android or Windows app stores. Editor’s note: Renderings are available at: https://www.cruiseimagelibrary.com/c/awg2ldyt. Holland America Line’s fleet of 15 ships offers more than 500 cruises to 415 ports in 98 countries, territories or dependencies. One- to 110-day itineraries visit all seven continents and highlights include Antarctica, South America, Australia/New Zealand and Asia voyages; four annual Grand Voyages; and popular sailings to ports in the Caribbean, Alaska, Mexico, Canada/New England, Europe and the Panama Canal. The line currently has a new 2,650-guest ship, ms Koningsdam, on order for delivery in April 2016 from Fincantieri shipyard, as well as a second Pinnacle Class ship due for delivery in November 2018. Fleetwide, the company features Signature of Excellence enhancements, a commitment totaling more than $500 million, that showcase the Culinary Arts Center presented by Food & Wine magazine — a state-of-the-art onboard show kitchen where more than 60 celebrated guest chefs and culinary experts provide cooking demonstrations and classes — Explorations Café powered by The New York Times, Digital Workshop powered by Windows, teens-only activity areas and all-new stateroom amenities highlighted by flat-panel TVs and plush Euro-top Mariner’s Dream Beds.